Here you can download our awesome Free PSD Mockup – Studio T-Shirt for your promoting your professional design! Our new free mockup in PSD were created by professional designers and can be used for your private and commercial needs. After downloading this mockup, you will be able to ensure the quality and ease of use. Using such professional free T-shirt PSD mockup, it is possible to make the best advertisement for your company or design very quickly. 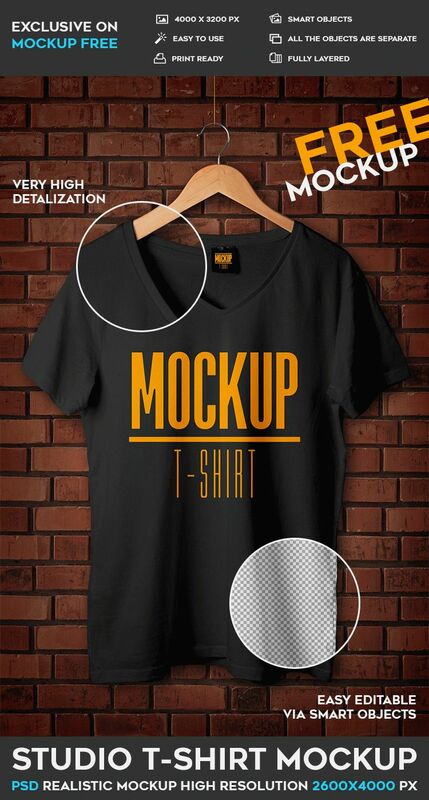 This qualitative PSD T-Shirt mockup can be easily customized without any problems in Photoshop. You can add your design and make any changes, such as change the background and add various elements if it is necessary. And of course, you won’t have any problems with adding the style exactly to this T-shirt. Also, you can see there the front end of the T-shirt against a brick wall background and you can use it this way of course. Easily download our professional free PSD mockup for implementing your professional ideas, for showing the necessary design to your clients or customers and for lots of other interesting ideas and aims you have! Elegant and really qualitative Studio T-shirt – this is absolutely Free PSD Mockup that can be very useful for designers and product promoters. Here on MockupFree you can find a lot of interesting Free PSD mockups for making presentations and saving a lot of time. Download only once this awesome PSD mockup and enjoy the results!